Around the yard you will want beautiful fountains and faucets for hose pipes. Conventional wisdom says you cannot just use a regular tap because the water in the pipe up to the tap end would freeze. 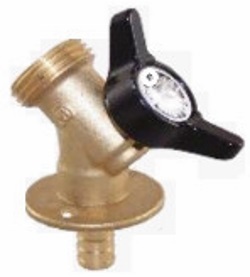 Yard taps have the water control at the bottom of the stem. When you turn the water off, the residual water in the stem runs out into the ground rather than staying in the stem to freeze. The negative with this sort of yard faucet is the high cost which means you cannot afford to have too many of them. I prefer to use lower cost faucets fed by 1/2" PEX pipe. PEX pipe can withstand freezing without bursting. As well as looking nice, fountains can be used to make the surface of water in a pond rough so that mosquitos do not lay their eggs in it. See the page dedicated to fountains here .